March brings with it the promise of spring and some special March sales that can help you both prepare and save money. Two holidays that will generate some special savings are St. Patrick’s Day on March 17, and Palm Sunday, on March 25. We have Easter in April this year, but retail stores will still be pushing Easter related discounts. Remember that Daylight Savings is March 11th. You may still be able to find some Valentine’s candy and decorations tucked away in stores, but for sure, Easter candy is already out and ready to buy. If you’re planning to store candy long-term, more than 6 months, always store them in airtight containers, away from light and heat. Mason jars work very well for candy and can be sealed with a jar attachment for Food Saver machines. I prefer the wide mouth attachment and using wide mouth jars, just because they are easier to fill. With St. Patricks’ Day on March 17, you will find corned beef and cabbage, carrots, potatoes, and eggs on sale the day after, March 18. You should buy at least two corned beefs and have one for dinner now and freeze one or more for later. Cabbage is good for pickling and dehydrating using these instructions. Buy lots of it if you like sauerkraut. Even if you have never made it before, give it a try with these simple recipes. There may also be St. Patrick’s Day treats, baked goods and alcohol sets on sale. Stocking up on alcohol, even if you’re a teetotaler, can be helpful for making things like tinctures. I’ve stocked up on vodka, in particular, because of its many non-martini uses. March is also National Frozen Food Month. There will be deals on all varieties of frozen foods and coupons in the newspapers and online for these items. With proper storage, frozen food can last a very long time. You may want to vacuum seal items that you plan to keep for more than 6 months. Some fruits and vegetables are even fresher when they have been frozen at their peak. And, dehydrating frozen food is the easiest thing ever and perfect for a beginner. You’ll need a food dehydrator, it can be inexpensive or top of the line, and bags of frozen fruits and veggies. Here are details for drying that food. Be sure to store it in either vacuum sealed canning jars or vacuum sealer bags, and keep in a dark, dry, and cool location. Fish and seafood will also be on sale this month as it’s the Lenten season. These can be canned using a pressure canner. Follow the safest canning instructions. Produce in season are the following according to Premeditated Leftovers. You might be able to buy them in bulk from food co-ops, such as Bountiful Baskets, and at farmers markets. Winter gear may still be on sale in some places, but you will start to see the spring and summer gear taking their place. 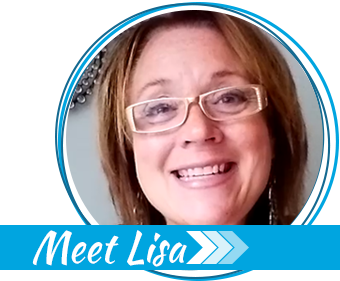 Linens and blankets may also be on clearance — as you may know, I love blankets and can’t get enough of them! Calendars and planners should be leaving the shelves this month, so look for deep discounts on those items. With spring around the corner, people will start thinking about spring cleaning. Cleaning supplies, as well as home fragrance supplies, will go on sale. Fragrance items will include candles, diffusers, and sprays. These make great gifts, so stock up on a few for early Christmas shopping. Humidifiers will still be on sale this month, too. If you have ever been congested, you know how handy humidifiers can be. If you find a good deal, it wouldn’t hurt to have one as a back-up. Jewelry can often be found on sale in March because there is not an occasion like Valentine’s Day or Mother’s Day creating a demand. If you can find a good deal, stock up on future gifts or stash things away for bartering purposes. St. Patrick’s Day is another good time to find plates, napkins, tablecloths, and decorations. Think ahead to Easter and see if any of the toys could be used in Easter baskets. Green tissue paper could be cut up and used as Easter grass or saved for Christmas. Digital cameras and small consumer electronics (MP3 players, DVD, and Blu-ray players, etc.) should be on sale this month, along with TVs, to make room for new models. These items can be used for entertainment and for documenting household inventory. Most digital cameras also have video recorders on them. 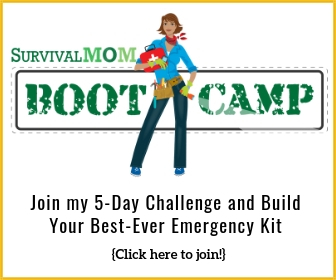 Having an MP3 player and/or portable DVD player in your shelter area or bug out bag could provide comfort (or distraction) for children during an emergency situation, and a video camera is VERY handy for documenting damage from storms or natural disasters. Video games might also be on sale this month as the holiday sales have started to wind down and the games are now considered “old.” You might also be able to find used copies of recently released games in stores. Video game systems and accessories may also be on sale, too. 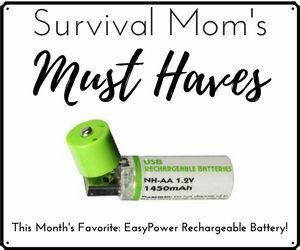 While The Survival Mom isn’t a huge fan of video games and reliance on electronics, they can make our lives easier in many ways. If you find a really good bargain on these, consider buying them to store in a Faraday cage. Gym memberships and workout equipment will go on sale in March as people start going outdoors more. Getting in your best physical shape possible is an important part of being prepared. Just be careful about any gym that requires a longterm membership and no easy way to cancel. Winter sports gear, including ski and snowboard equipment, will be on sale since it’s the end of the season, but in many parts of the country, it’s going to be a while before the snow melts! Winter camping supplies and gear is already on the discount displays. 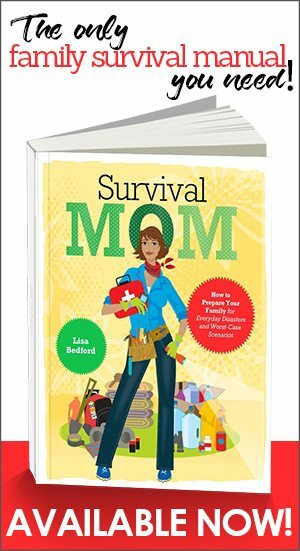 Walmart, Cabela’s, REI — they are all wanting to move heavy duty sleeping bags, winter-weight clothing, and the like. It is definitely worth a trip to one or more of these stores to look for these bargains. Luggage goes on sale in March since it is not considered a big travel month. A new set of luggage is a great wedding or graduation gift, and if you find a really sturdy suitcase on heavy-duty wheels, consider it for an emergency kit/bug out bag option. March can be the best time to find a weekend getaway deal or cash in miles for an airline ticket. Since it’s the end of the ski season, you can find deals on lift tickets and at ski resorts. Again, these are fun excursions for anyone, but for the penny-pincher, they make great gifts AND you’ll be saving money. If you spot a particularly good bargain, see if you can hold on to that lift ticket until next season. It never hurts to ask! By the end of March, you should have $78 saved if you’re following the weekly savings plan. If you have extra right now, perhaps going to a higher week in the chart and putting that money away would be a smart thing to do. 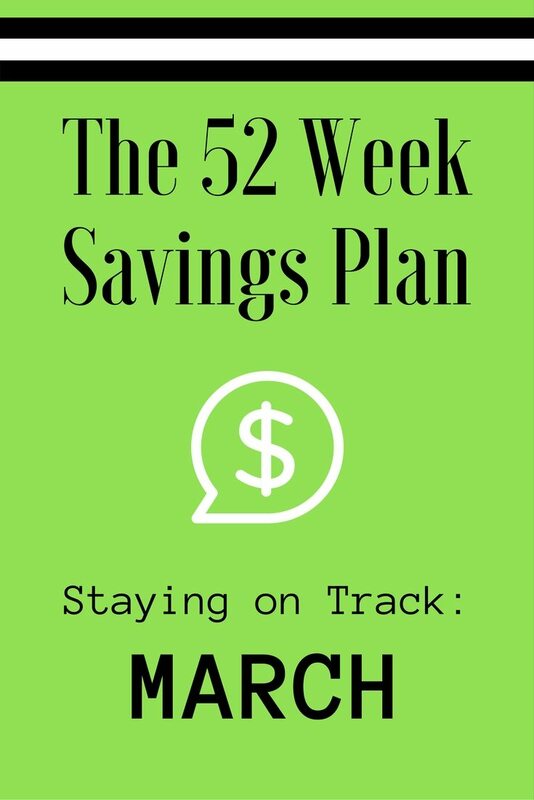 You can make the 52 Weeks Savings Plan work for you with a little customizing! The key to being a winner when it comes to saving money is to pinch pennies wherever you can with purchases and then put even small amounts saved in your savings stash. TIP: Now is the time to start thinking how you would use any tax refunds or 2017 bonus you may receive. Enjoy March and its deals, but look forward to April when we’ll see some great bargains tied to Easter (April 5) and spring to help you save AND prepare!